A Serious Twist on SnackingPacked with AlmondsNatural IngredientsIt's amazing what you can create when you're not even trying... but then, the best ideas are often the most obvious. 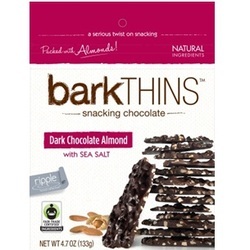 Made with natural ingredients, barkTHINS snacking chocolates are a handcrafted new twist on traditional chunky chocolate bark. Our super thin slivers of rich, fair trade dark chocolate are loaded with salted almonds and perfectly portioned for the serious chocolate lover. They're thin, snackable and unbelievably delicious!